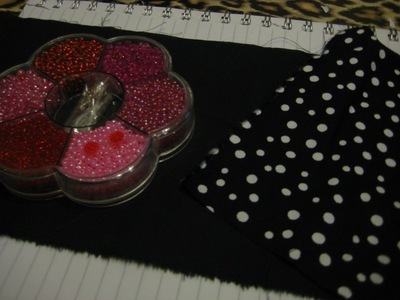 First you need to choose the fabric, beads and sequins you want to use. As for fabric I used a small piece of white fabric for the bats' fangs, some plain black, and black with white dots fabric for the actual bat (all of them were left-overs from previous projects, so really you can use whatever pattern/colour you want). I used the sequins and beads for the eyes and the blood, so they were red, but again, you can choose whatever colour you feel like. 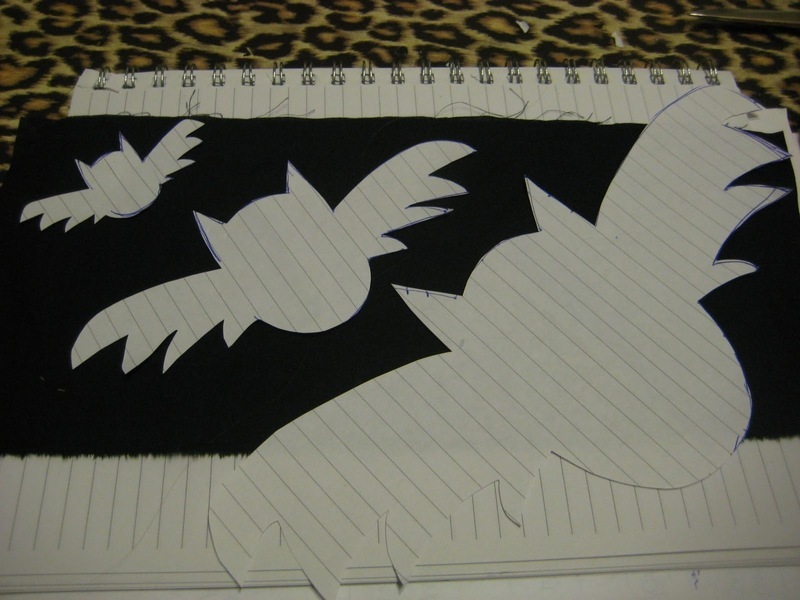 Once you have the materials ready, take a piece of paper and a pencil and draw and cut the patterns you want, but try them not to be too small, as it would be very difficult to sew them onto the t-shirt later on. 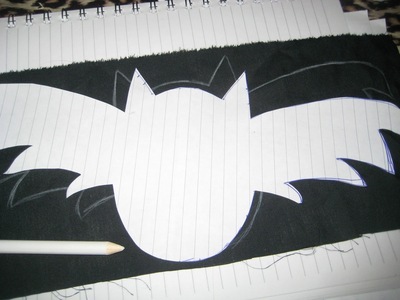 The biggest one I drew was around 10.5 inches wide/5 inches tall, and the smallest one was 5 x 2.5 inches. I chose to have bats on my t-shirts, but again, you can have whatever you like best. Copy the pattern onto the fabric using chork or a fabric pencil as many times as you need. 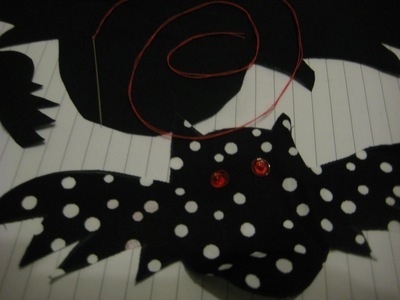 Decide where you want the eyes and fangs to be and mark them with a pin or fabric pencil. Get your needle and thread ready to hand-sew the sequins and beads. 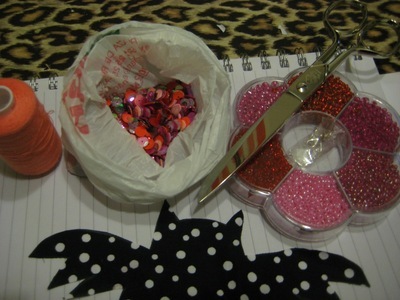 What I do is I palce a bead on a sequin and sew them together because that makes it more consistent and they won't fall as easily. Also, to make the fangs, cut two little triangles out of the white fabric and hand-sew them where you had previously decided (but remember, don't make them too small otherwise sewing them would be very difficult!!). If you want your bat to have a little blood drop on its fang, you can sew one using the same method as for the eyes (bead on top of a sequin). At this point really you can decorate your little friends in whatever fashion you want. Now decide where you want them to be on your t-shirt and pin them on the right spot. 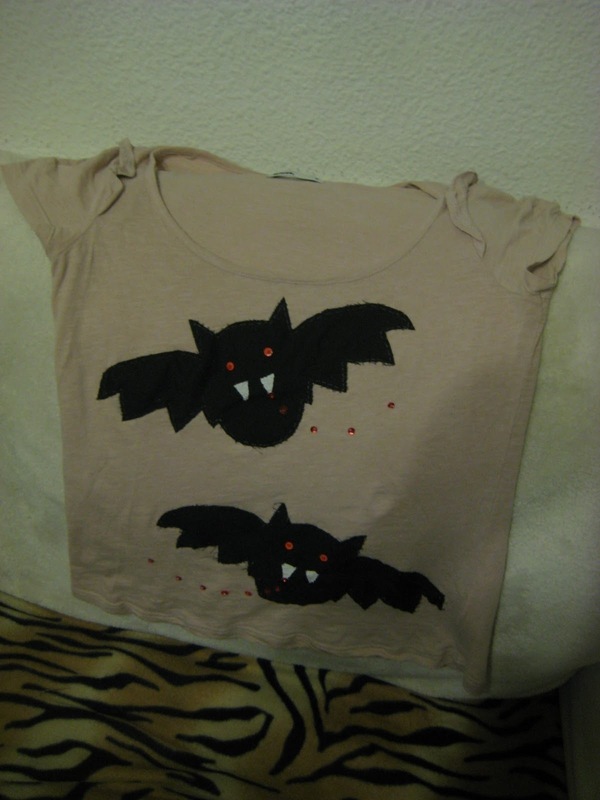 To sew them using a sewing-machine, put a piece of white paper underneath the first layer of your t-shirt, right under where you are going to sew your new little friends. 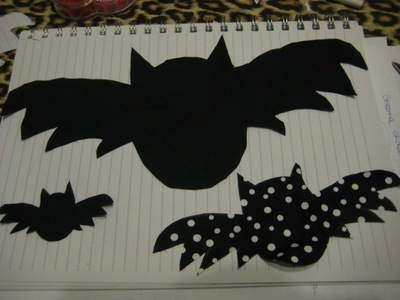 Choose your favourite stitch and start sewing the edges carefully. The reason why you need a piece of paper is because that gives a more consistent surface so your fabric won't wrinkle while you are sewing. Once you finish, the paper must be sewn to the back of your pattern, but you can easily remove it. (There are plenty of appliqque turotials on youtube that you can follow). Otherwise, you can do it by hand. 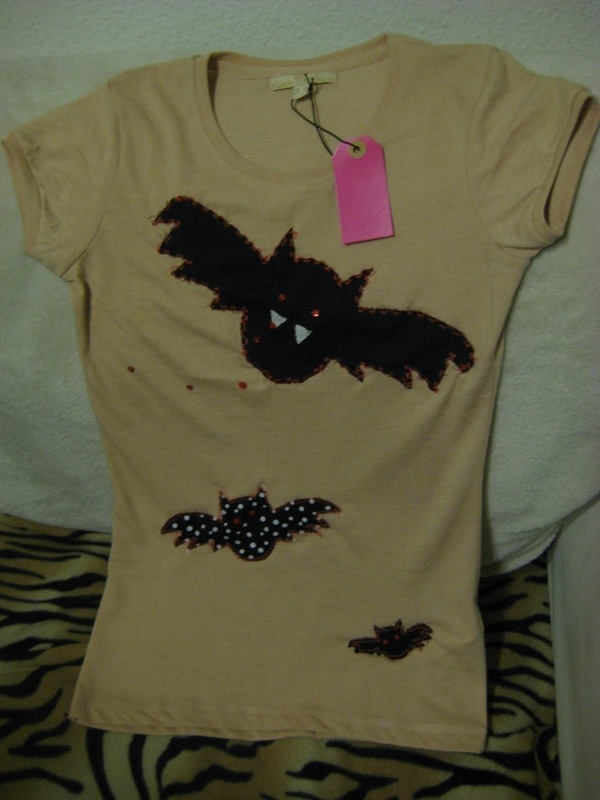 You can decorate the rest of the t-shirt with a few more blood drops.